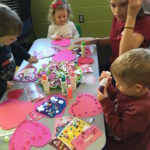 Celebrate Valentine’s Day with your family making crafts, playing a game, enjoying a sweet treat and listening to a story. Please register all children. Ages 2+ years.